Successful change management requires a large commitment from executives and senior managers, whether the change is occurring in a department or in a complete organization. Leadership from the senior team is the most significant factor in helping employees to buy into and support needed changes. Reviewing an 18-month complete organization transformation with a senior executive, he said that his most significant mistake, as he had led the organization in a new direction, had been his patience with his senior team. He wished retrospectively that he had fired several of the most change-resistant members early in the change process. He had decided that keeping change-resistant people in senior positions had impeded the implementation of all of the goals that they had mutually agreed to and set. Executives play a powerful role in organizational progress—or not. He believed that he could have accelerated the changes that ultimately took 18 months if he had replaced change resistant leadership early in the change process. In his move from a traditional manufacturing facility and approach to one that emphasized employee empowerment, quality, and continuous improvement, he spent considerable time and resources trying to bring several members of his senior team along. Senior leaders can do the following to lead effectively during successful change management efforts. Establish a clear vision for the change management process. Paint a picture of where the organization will end up and the anticipated outcomes. Make certain the picture is one of reality and not what people wish would occur. When this vision and communication is done well, each employee should be able to describe what he or she will experience on the other side of making the change. For employees, the most significant factor is the impact of the change in their job. This is an often neglected step. Appoint an executive champion who owns the change management process and makes certain other senior managers, as well as other appropriate people in the organization, are involved. Change is easier when a large number of people who must change are involved in the planning and implementation. Pay attention to the changes occurring. Ask employees how things are going. Focus on progress and barriers to change management. One of the worst possible scenarios is to have the leaders ignore the process. Sponsor portions of the change or the change management process, as an involved participant, to increase active involvement and interaction with other organization members. If personal or managerial actions or behaviors require change for the changes to take hold in the organization, model the new behaviors and actions. Walk the talk. Senior leaders play a huge role in teaching their reporting staff expected and desired behavior. Establish a structure which will support the change. This may take the form of a Steering Committee, Leadership Group, or Guiding Coalition. Change the measurement, reward, and recognition systems to measure and reward the accomplishment of the new expectations. Make the recognition public so that you reinforce the behaviors that you really want to see with all of your other employees. Solicit and act upon feedback from other members of the organization. What's working? Not working? How can you improve the processes? When you act on feedback or decide not to, make sure you have let the employee with the idea know what you did or why not. Recognize the human element in the change. People have different needs and different ways of reacting to change. They need time to deal with and adjust to change. 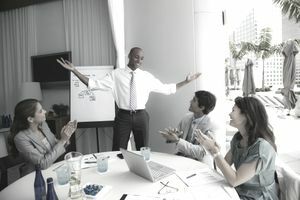 Senior leaders must participate in the training that other organization members attend, but, even more importantly, they must exhibit their “learning” from the sessions, readings, interactions, tapes, books or research. Be honest and worthy of trust. Treat people with the same respect that you expect from them. Change is difficult and progresses when the people involved feel supported, respected, and that you care about them.